Babe Ruth, an American baseball player, was one of sport's most famous athletes and an enduring legend. George Herman Ruth Jr., later known as Babe Ruth, was born on February 6, 1895, in Baltimore, Maryland, one of George Herman Ruth and Kate Schamberger's eight children. Of the eight, only George Jr. and a sister, Mamie, survived. Ruth's father owned a tavern, and running the business left him and his wife with little time to watch over their children. Young George began skipping school and getting into trouble. He also played baseball with other neighborhood children whenever possible. At the age of seven Ruth was sent to the St. Mary's Industrial School for Boys, a school that took care of boys who had problems at home. It was run by the Brothers (men who had taken vows to lead religious lives) of a Catholic order of teachers. Ruth wound up staying there off and on until he was almost twenty. At St. Mary's, Ruth studied, worked in a tailor shop, and learned values such as sharing and looking out for smaller, weaker boys. He also developed his baseball skills with the help of one of the Brothers. Ruth became so good at baseball (both hitting and as a left-handed pitcher) that the Brothers wrote a letter to Jack Dunn, manager of the Baltimore Orioles minor league baseball team, inviting him to come see Ruth. After watching Ruth play for half an hour, Dunn offered him a six-month contract for six hundred dollars. Dunn also had to sign papers making him Ruth's guardian until the boy turned twenty-one. When Dunn brought Ruth to the Oriole locker room for the first time in 1914, one of the team's coaches said, "Well, here's Jack's newest babe now!" The nickname stuck, and Babe Ruth stuck with the team as well, performing so well that he was moved up later that year to the Boston Red Sox of the American League. Ruth pitched on championship teams in 1915 and 1916, but he was such a good hitter that he was switched to the out-field so that he could play every day. (Pitchers usually play only every four or five days because of the strain that pitching has on their throwing arm.) In 1919 his twenty-nine home runs set a new record and led to the beginning of a new playing style. Up to that point home runs occurred very rarely, and baseball's best players were usually pitchers and high-average "singles" hitters. By 1920 Ruth's frequent home runs made the "big bang" style of play more popular and successful. In 1920 Babe Ruth was sold to the New York Yankees for one hundred thousand dollars and a three hundred fifty thousand dollar loan. This was a huge event which increased his popularity. In New York his achievements and personality made him a national celebrity. Off the field he enjoyed eating, drinking, and spending or giving away his money outright; he earned and spent thousands of dollars. By 1930 he was paid eighty thousand dollars for a season, a huge sum for that time, and his endorsement income (money received in return for public support of certain companies' products) usually added up to be more than his baseball salary. Ruth led the Yankees to seven American League championships and four World Series titles. He led the league in home runs many times, and the 60 he hit in 1927 set a record for the 154-game season. (Roger Maris hit 61 home runs in a 162-game season in 1961.) Ruth's lifetime total of 714 home runs is second only to the 755 hit by Hank Aaron (1934–). With a .342 lifetime batting average for 22 seasons of play, many consider Babe Ruth the game's greatest player. When Ruth's career ended in 1935, he had hoped to become a major league manager, but his reputation for being out of control made teams afraid to hire him. In 1946 he became head of the Ford Motor Company's junior baseball program. He died in New York City on August 16, 1948. Creamer, Robert W. Babe: The Legend Comes to Life. New York: Simon and Schuster, 1974. 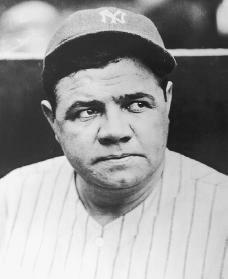 Miller, Ernestine G. The Babe Book: Baseball's Greatest Legend Remembered. Kansas City, MO: Andrews McMeel, 2000. Ritter, Lawrence S. The Babe: The Game That Ruth Built. New York: Total Sports, 1997. Smelser, Marshall. The Life That Ruth Built: A Biography. New York: Quadrangle/New York Times Book Co., 1975. Reprint, Lincoln: University of Nebraska Press, 1993. Van Riper, Guernsey. Babe Ruth, One of Baseball's Greatest. Indianapolis: Bobbs-Merrill, 1983. Wagenheim, Kal. Babe Ruth: His Life and Legend. New York: Praeger, 1974. Reprint, Chicago: Olmstead Press, 2001. Thanks for publishing this! I was also doing a report on this and it helped a lot! Great! This is just what I needed! I really enjoyed this! Got a larger source you could give me about Babe Ruth?... school project. Good information though. finally just what I needed for my project, thanks! thanks. just needed this info for a short presentation and it helped me a lot. i had to do a project on him and this was perfect. i wrote a 3.5 paragraph all from this website!